Normalize is split into multiple repositories. Most of these repositories can be found within the Normalize GitHub organization. When requesting features or reporting bugs, please try to open an issue in the correct repository. discussions - a repository for any general discussions. Don't know where to open an issue? Want to ask for support? Open an issue here. Typing https://nlz.io/ everywhere becomes tedious quickly, so Normalize allows you to use shorthands for dependencies. Shorthands simply expand to the long Normalize URLs. However, due to the wide remote support Normalize provides, shorthands require a certain degree of specificity. Thus, shorthands are second-class citizens. Normalize will eventually provide a custom module loader for these shorthands. You shan't use shorthands in CSS and HTML as they do not allow custom loaders. You shan't use shorthands in libraries, only applications where you can expect a custom module loader to be used. Creating libraries with shorthands is too vendor-specific. URLs should always work in any environment! @ is used for versions and commits. Do not use #. Note that @<version> here is required for the shorthand, otherwise it could be a file. remote is the remote name or alias. Some remotes, such as npm, have or will have namespaces. However, it will be treated as if it does not as most modules do not use namespaces. As you can see from above, npm modules have a custom shorthand syntax due to this pecularity. nlz(1) is the stopgap CLI tool for normalization proxies. 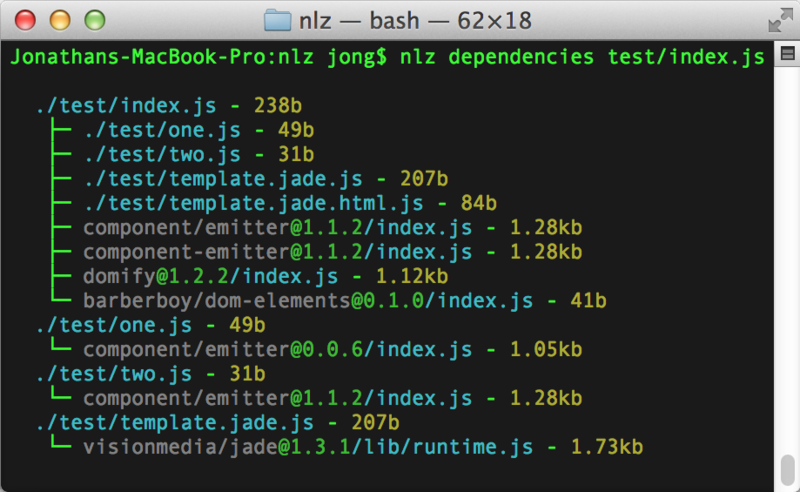 Eventually, nlz build(1) will be completely optional, and nlz(1) will primarily be a CLI tool for inspecting your app/component's dependency tree. nlz(1) supports node v0.10+, but you should use node v0.11+ for better performance as generators are extensively used in the source code. Be sure to globally install any transforms you'd like to use as well. You can use this to inspect all the files in the build as well as its dependency tree. nlz(1) uses this file in other commands, such as nlz-dependencies(1), to help inspect the files and the dependency tree. You may use this file to create your own SPDY push server or middleware. These are the primary build command. You may think of it as browserify's build command with multiple entry point support as well as CSS and HTML file support. Most of these parameters and options can be set via .nlzrc, allowing developers to simply run nlz build --watch. Note that the builder does not support buildilng web components! This is essentially impossible to do. Only use web components in a SPDY environment. The destination folder, defaulting to build/. The destination file will be the same name as the entry point's file name. Watch the source files for changes and rebuild automatically. You should use this as rebuilds are fast and incremental. Simply loading nlz(1) takes a considerable amount of time, especially if you use a lot of transformations. This is aliased as nlz watch. Create a standalone, UMD-wrapped JS bundle. Similar to nlz-build(1), except no files will actually be built. Use this just to create normalize-manifest.json, which is required for the dependency inspection commands. By default, nlz-manifest(1) calculates the minified size of assets. This gives each file a better representation of its size in the final bundle. However, this takes a long time compute. Set --no-min to disable minified size calculations. List all the dependencies, included nested ones, of a single entry point. Unlike other "ls" type commands, this command does not create an incredibly nested tree. The file size is listed next to each file. By default, dependencies of remote dependencies are not traversed. To include them, use the --remotes option. This command is similar to nlz-dependencies(1), except shows all the nested dependents of a particular file. Any file included in the manifest could be used as an entry point. Lists all remote dependents of which you use more than a single version. In frontend development, you don't want duplicate dependencies as it means unnecessary bandwidth usage. The "redundancy size", or the estimated bytes you could save by de-duping each dependency. Each version of the dependency used. Each file of each dependency used, it's size, and its dependents. List the sizes of an entry point and its dependencies, as well as its combined size. Useful for gauging which dependency is the largest. Create a graph of your dependency tree. Run nlz graph -h for more details. .nlzrc is an optional JSON configuration file for local environments. It's completely optional. You may have a global, .nlzrc configuration for your computer as well as local .nlzrc configuration for each app. For example, you might want to point all your requests to a proxy on your network instead of https://nlz.io. The entry points for the build. This allows you to not specify the entry points every time you run nlz build(1). This is to set a custom proxy other than https://nlz.io. proxy should be the full host, including the port. Set self-signed to true if the proxy is using a self-signed certification, otherwise an error will be thrown. Remember, proxies must always use SSL. Option whether to include each file's minified length in the manifest. This takes a long time to calculate, so is only recommended when you do --watch. Set to false if you never want to calculate this. By default, all files are stored to process.cwd() + '/repositories'. Thus, every app or component you work on will have its own directory folder. This may be less than ideal for you as you'll have multiple copies. You may optionally set this directory to a global directory like ~/.repositories so that every app or component you work on share the same files. It will also make installations a little faster. Use a custom transform function instead of those supplied by Normalize. See normalize-transforms for more information. Pass options to the transform function mentioned above, which is normalize-transforms. This allows you to use a custom normalize-manifest.json file name. 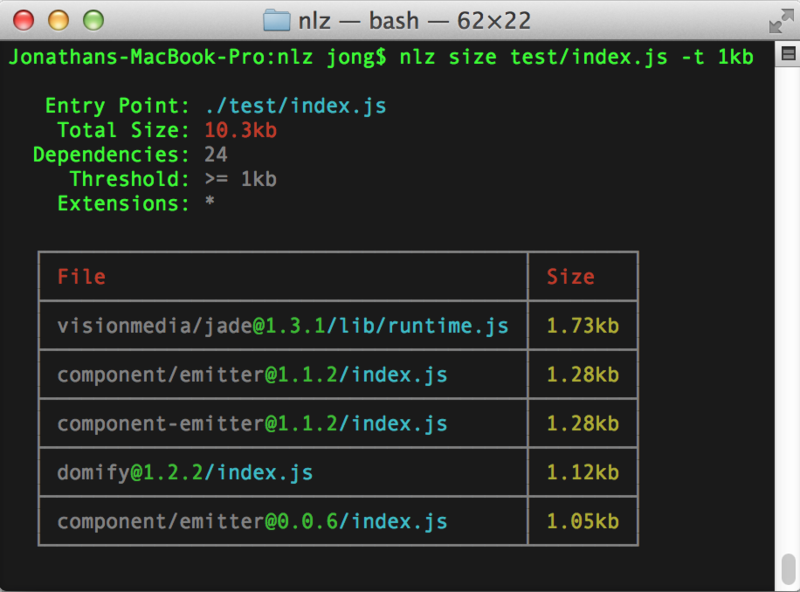 These are all the transforms available for both the normalization proxy and nlz-build(1). Transforms are not orthogonal to another, so we have to make sure each plugin interacts with each other well. The purpose of normalization is for everyone to be on the same page. It's counter productive to have different semantics for the same transform across applications. PRs for additional transforms are welcomed as long as there's a valid use-case and people would actually use it. Feel free to create feature requests and pull requests in the transform.js repository. For example, template.jade.js returns a jade render function whereas template.jade.html.js returns the jade template as a compiled string. You can also compose multiple transforms together. For example, .jade.html.js is a composition of .jade.html and .html.js. Convert LESS files to CSS. Convert SASS files to CSS. Convert Stylus files to CSS. All extensions whose corresponding MIME type is text/* are automatically transformed to a JS string using JSON.stringify() unless superceded by another transform. Transforms JSON files to a JS object. Transforms a CoffeeScript file to JS. Compile jade templates to a function. Compile markdown templates to an HTML string using marked. Note that without .html, the actual markdown is returned. Compile React .jsx templates to JS. Compile an HTML string to an element using domify. This is useful for web components and templates. This is the public HTTP API for https://nlz.io as well as any normalize-proxy. If you're interested in setting up your own proxy, consult the normalize-proxy repository itself. Different proxies will have different hostnames. The version and file may not be included in some end points. Every proxy must serve via HTTPS and SPDY/HTTPv2, even with a self-signed certificate. The primary reason is that some browsers intend to not support SPDY without SSL. A supported remote's name, for example github/. Aliases will also be supported and will simply redirect to the canonical short name. For example, github.com and raw.githubusercontent.com would redirect to github. The owner of a repository. If the remote does not have a namespace, the user should simply be -. The name of the project/module/component. Any version as defined by http://semver.org. You should not include leading vs and = in single versions otherwise a redirect will occur. Versions can also be git branches and commit SHAs if the remote is accessed via git and will redirect to the full commit sha. You may still GET files directly, even with transforms. All of the files' dependencies will be SPDY pushed to the client. A redirect may be returned as a response. If this is the case, the redirect location will be SPDY pushed as well. ?source - return/redirect the source file and its dependencies all without any transformations applied. Useful for building server-side. If any of these query strings are included, then all the pushed dependencies will also include the same query string. For git remotes, this will git fetch -f the entire repository to the proxy, updating all the versions. For non-git remotes, this will check for the latest version of the project and install it locally. You may consider this the optional "publish" step of Normalize.IO. Will return an array of versions that are currently available on the proxy. If no versions are installed, a 404 and an empty array will be returned. If you pushed a new version of a package, but the proxy has not installed it yet, simply install it by hitting the pull entry point or GET any file. Note: he semantics of this endpoint is subject to change. In particular, it should return all available versions on the remote. Returns relevant information about the proxy including hostname, version, and supported remotes. Creates a polyfill bundle based on the client's user agent. See polyfills/polyfills for more details. Packages are "normalized" based on these JSON files in descending priority. This is particularly important if you compile your module for one package manager but not the others. Thus, if you have to compile your module for a package manager, compile it for bower. Only npm and github-style dependencies are supported. Only semantic versions are supported - versions that have weird suffixes will be ignored. Other types of dependencies such as tarballs will be ignored. Modules that must be normalized and have circular dependencies are not supported. In fact, these modules may actually mess up the proxy. Please don't create circular dependencies! Use devDependencies or something instead.